About Us - Stonecraft Jewelers | Serving the Elko, Nevada area. Stonecraft Jewelers has been in business and serving the community for more than 11 years. The highly regarded staff has combined experience of more than 29 years. Stonecraft Jewelers has the largest in-store bridal selection in Elko, NV backed by a lifetime warranty. Rest assured you will find what you are looking for when you come to our fine establishment. Even if you don't find what your looking for in the store, we have a digital goldsmith that allows you to create exactly what you want to make your dream ring a reality. Not only do we specialize in finding you the perfect ring but we also keep the beauty in the rings alive. We specialize in jewelry restoration and repair of all types. 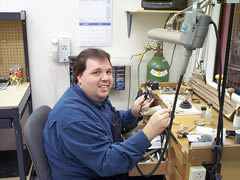 We do any jewelry repair from basic sizing to complete restorations to custom build and make. We have a Better Business Bureau rating of A+ and have so for quite some time. Stonecraft Jewelers has also been a member of the Chamber Of Commerce in Elko, NV for 11 years running. We are proud to be a part of this community and will continue to present you with the highest quality rings and jewelry repair.